From our friend, Steven Miller, Merchandise Communications Manager and posted on the Disney Parks Blog. 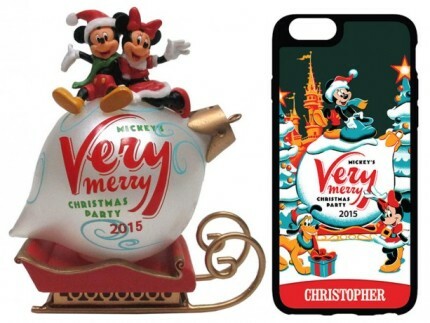 With the return of Mickey’s Very Merry Christmas Party at Magic Kingdom Park, I wanted to give you a preview of some commemorative merchandise created for this year’s event. One of the most popular items from last year was the retail MagicBand. I’m happy to report a new limited edition MagicBand will be released this year starting November 8. This MagicBand will have a retail of $29.95 and an edition size of 4,000. Other items will include t-shirts for adults and kids, and a decorative holiday ornament. At the new D-Tech on Demand location in Tomorrowland Light & Power Co., guests will be able to create and personalize a case for select mobile phones. We currently offer cases for iPhone 4/4S, iPhone 5/5S, iPhone 5C, iPhone 6/6+ as well as Samsung Galaxy SIII, Samsung Galaxy 4, Samsung Galaxy 5 and Samsung Galaxy 6. Finally, we will release several Disney pins created especially for the event. There is a limited release logo pin and a jumbo sized pin featuring Mickey Mouse and Pluto. The latter has an edition size of 750. The limited edition pins will include artwork of characters like Dumbo and Timothy; Captain Hook and Smee; and, my favorite, the Hitchhiking Ghosts from The Haunted Mansion. Annual Passholders should look for a limited edition pin with Huey, Dewey and Louie (this pin has an edition size of 3,000). Mickey’s Very Merry Christmas Party is held on select nights, November 8 – December 18, and is separate from regular Magic Kingdom Park admission. Tickets are available now on DisneyWorld.com. See my fellow author Shawn Slater’s article for more details about the event this year.